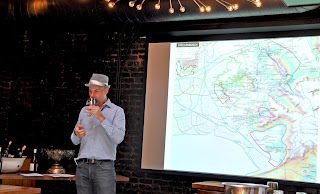 To be brutally honest, my knowledge of South Africa going in to a recent trade tasting if its wines mostly came from Breaker Morant, Peter Gabriel's "Biko," and that monumental world music highlight of the '80s, The Indestructible Beat of Soweto. And despite its Boer War setting, Breaker Morant is an Australian film, anyway. So, to put it bluntly, I had a lot to learn. 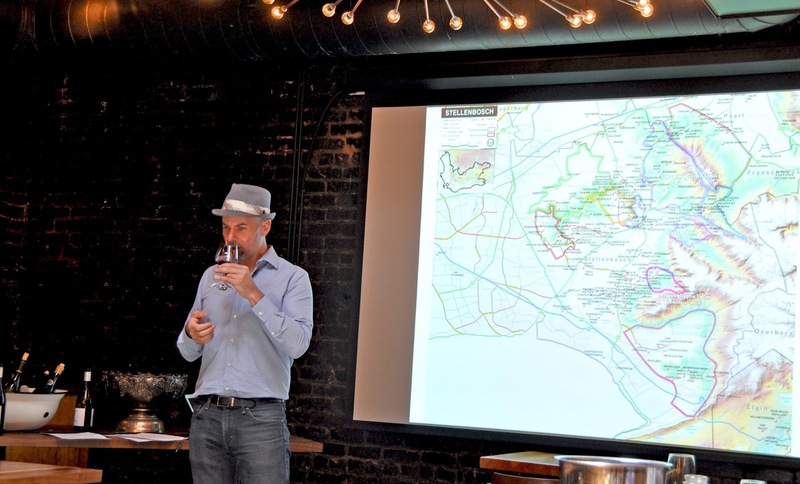 Luckily, as the billing went, "Jim Clarke [pictured above], former Wine Director at Megu and Armani Ristorante in New York, will put the wines in context, discussing terroir, traditions, and current trends." That was a lot to do in a bit under 2 hours, but at least now I've got a better sense of what's up in South Africa (it seems unfair they got beat to the moniker down under, in a way), plus the photos and discussion made me realize many of their wine regions are quite like Santa Barbara's, so that's fascinating too. There's no point in running you through the whole story here, as it would be secondhand and more than you need. So the accelerated version: early fine wines, Napoleon thumbs up, phylloxera bugs down, WWI kills too many people to make anyone care about wine, apartheid means embargoes of everything. In the middle of all that, there's KWV, a business that controlled wine and led to a generally down to price not up to quality approach. Since the end of apartheid everything has improved though--the magic of markets. Winemakers discovered you could grow fine cold climate grapes closer to the ocean (it's a place with cross-wind currents and diurnal temperature shift--hi, Santa Barbara!). Old vines started getting some care, but not too much, because you want to stress those vines and lower yield to concentrate goodness. And you have a lot of Chenin Blanc--it's the most commonly grown grape there. (I won't make a joke they grow more white, I won't make a joke they grow more white.) Some of it is fascinating stuff; I can't say enough about the Luddite Chenin Blanc we tasted: think white peach and apricot, but more importantly some ethereal quality that makes it dance across the tongue and linger. A kind of perfume, in the best of ways, one that seems to want to unlock your best memories. Some pretty unpleasant memories are often associated with South Africa's trademark red varietal, Pinotage. This cross of Pinot Noir and Cinsaut got a bad rap in the 1980s-90s as its low acids made it any easy home to all sorts of nasties, especially before all South African wineries kicked up their hygiene regimens. At the time Pinotage often had a nose of rusty nails or Band-aids, not exactly smells conducive to yumminess. But times, and methods, have changed. Try, for instance, especially at $15 a bottle, Painted Wolf Guillermo Pinotage, with a bit of soul added with some new oak. Plum, red berries, a bit of pipe tobacco. Grown in the Swartland (the grasses there turn black in summer), so with a bit more heat in the growing season, and a bit more acid than most of its varietal. Plus sales go to help the endangered African wild dog and if you follow this link you'll want to save them, too.